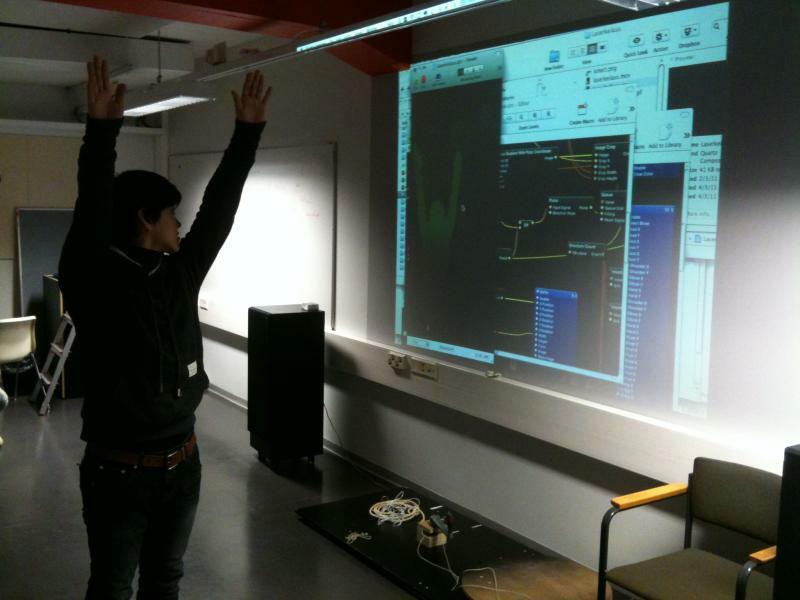 On 7/3/2011, we had the second “Kinect Jam Session” at Media Lab Helsinki. Forrest presented work done for the Computational Photography course. One project consisted of a “carousel” 360 model slitscan. Any motion detected by Kinect warps the 3D model. Processing was used for this, and Forrest mentioned the programming chalenges presented by this type of 3D representation. Another project consisted of photos and videos of dancers/movement, again using slitscan techniques. The photos have a resolution of 7055×1920 pixels, and compress (or translate) 6 minutes of video. Cinder was used for this project, together with a Photoshop script. Kinect was not intensively used in this project. Dipti presented her Interactive Fireworks project, already shown at Media Lab Demo Day in December. It was done with Processing. Dipti mentioned that turning the sound on makes the project run slower. Palash showed some explorations using openFrameworks and blob detection at different depths. He was surprised by the speed of the prototype application (80fps), despite the heavy calculations involved. When discussing that TuioKinect-based projects demanded that participants stay within a certain distance of Kinect, Michihito Mizutani posed a question: can glass be used in a IR related project? How does glass affect depth sensing? Palash and Dipti ran a test right away in our “paja” room, and concluded that, despite some artifacts, IR detection works fine through glass. In his second presentation within these “Kinect sessions”, Matti (http://mansteri.com/) showed the “behind the scenes” aspects of the projects he showed in his previous one. In all of these, Quartz Composer was used. The first project Matti showed was an upcoming medical-related project. An interesting range of gestures can be used to zoom and flip between images. Finally, he showed one more project under development, the forest-related Laserkeilaus, allowing persons to be represented as trees. To wrap up the session, I showed the Moullinex – Catalina music video (Portuguese band and video directors), produced using Kinect for 3D capture. Thankfully, there were 3D glasses around, so we could watch the video in 3D.